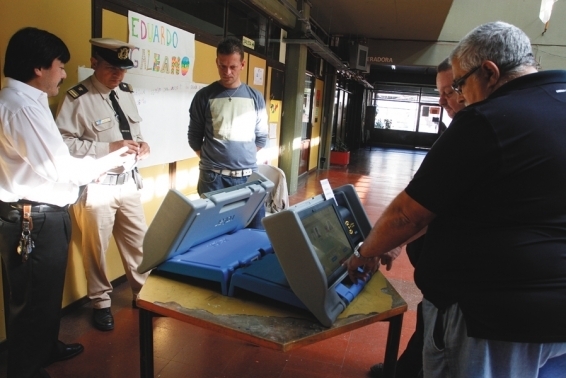 Doubts surround an electronic ballot box in Buenos Aires. Only days away from the July 5 elections, Argentina’s capital, Buenos Aires, finds itself deep in a distrust crisis due to the use of electronic ballots provided by the local company MSA (Magic Software Argentina). The reasons include a hardly transparent tender process, the selection of an electoral technology model that only works halfway (it only automates tallying), and on top of it all, an awkward implementation process, which has been strongly criticized for its many and important flaws in training users. The adoption of this system has been plagued with improvisation, insomuch authorities were forced to suspend its use for the primary elections last April. Different political and civil society spokespeople have voiced their concerns, warning that the city is not prepared to use the electronic ballot. While Mariano Recalde, one of the candidates to Head of Government of the city, accused the authorities of “improvising and experimenting with the people”, Professor Beatriz Busaniche questioned the way the new system has been implemented, considering that the “training being provided to citizens is not enough.” She also accused the company (MSA) of “not sharing the necessary information allowing to fiscalize (the process) correctly.” Moreover, deputy Hernán Rossi criticized the fact that implementation was not done progressively. All of these problems have not only sparked strong questioning, but the lack of training for both political party counsels and voters became a reason for filing a lawsuit before the Supreme Court, which ultimately decided to dictate that the Buenos Aires government must guarantee user training. At the same time, legislature approved a Law that requires placing a test device at each electoral constituency on election day, so that voters have the possibility of becoming familiar with the system. This situation reveals how unpolished the electronic ballot adoption process has been in Buenos Aires. The city will not be using a model that really automates the voting, but instead it will be employing the technology applied by MSA in Salta, which is known as “an electronic ballot box with smart ballots“. The technology provided by this company is not a comprehensive e-voting solution but a device designed to automate tallying only. This is how the flaws of manual voting remain latent. 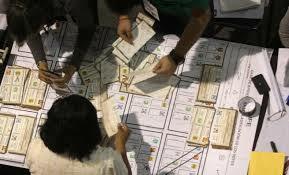 The setbacks caused by the new voting mechanism could prove to be costly for the Argentine capital. Trust in the system is what enables citizens to attend polling stations and strengthen democracy, while those elected can assume their posts covered by legitimate voting. We will have to wait and see if Buenos Aires is capable of sorting out these problems or if doubts are here to stay, at least until the automated model finally adopted is in effect transparent, safe, and reliable for all. Mexico had to recount votes from 60% of the polling stations during the federal elections. Last June 7th, Mexicans headed to the polling stations for its Midterm elections. And after polls closed, instead of releasing results, the National Electoral Institute (INE) had to announce the biggest vote recount in Mexico’s history— 60% of the installed polling stations. Unfortunately, in some states, the Preliminary Electoral Result Program (PREP) suffered considerable delays due to the processes coordinated by the newly formed body INE. Poorly trained polling station officers delayed the delivery of count reports at the data centers. The internal report of the recounts showed that in 22,963 out of the 88,444 polling stations recounted, the difference between first and second place was less than the number of void votes. Besides, vote tallies had to be verified in 48,057 cases because the number of votes did not match the number of voters, while 9,929 of the polling stations simply did not have a count report. Such discrepancies constitute a clear evidence of the poor training operators received and also point at manual voting as a problem in itself. Manual voting brings great disadvantages both for voters and for those who count votes. It shouldn’t come as a surprise that the transportation of thousands of voting minutes to hundreds of results consolidation and processing centers can turn into a cumbersome task. The logistic challenges INE faced, which affected the Preliminary Result Program—just another name for an unofficial vote count carried out and disclosed on election day—caused confusion and distrust among the citizens. This situation forced the authorities to delay the announcement the official tally another seven days. It was only on June 14 when the definitive electoral results were finally delivered. There is no doubt that Mexico is in the middle of a crossroad: to remain using an obsolete manual voting system which is proving disastrous or to give more protagonism to electoral technology. The adoption of an automated model of tallying or voting would not only eschew double counting and eliminate all these problems (as aggregation would be fast and precise), but it would eliminate the need to conduct preliminary results. Moreover, it would also enable authorities to announce official results only hours after closing the election. 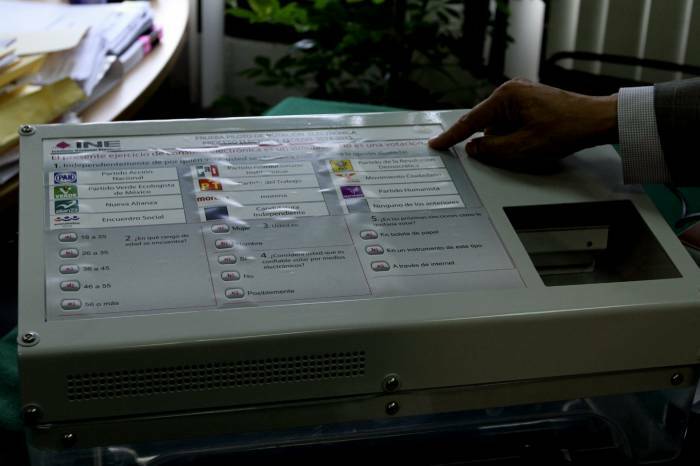 Mexico’s National Electoral Institute (INE) has set the goal of automating the country’s electoral system by 2018. Three years away from the deadline, the organization is still facing various obstacles. However, in light of the June 7 federal elections, the electoral agency will present an e-voting model designed and built in the country. The pilot test that will be deployed in District 02 of Chihuahua, District 03 of Aguascalientes, and District 04 of Hidalgo seeks to become the breaking point enabling Mexico to close the technological-electoral gap where it lags behind other Latin American countries. Information presented thus far by INE shows that Mexico copied some of the world’s best practices in e-voting. One example of this is the fact that the voting machines have the capacity to print vote receipts on paper, an electoral guarantee pioneered in Venezuela. It was also revealed that the devices have a screen where voters will mark their selection, and at the end of the day the machines will print minutes with the results, which will be immediately transmitted to a data center. The experience was designed so that voters can interact with 1,500 machines distributed across three districts in the three states chosen for the test after the voting in the federal elections (for 1,996 posts, including local and national deputies, mayors, and heads of delegation). Thus, they can verify the simplicity of the process, as well as the guarantees it offers. INE’s Statistics and Electoral Documentation Director, Gerardo Martínez, pointed out that aside from the technical benefits e-voting offers, Mexico wants to leverage technology, as the electoral agency estimates that with the jump from paper votes to electronic ones, the cost of each vote would go from 56 cents (0.036 dollars) to 3 cents (0.0019 dollars). The electoral agency’s bet is that after the e-voting test run, both voters and political actors will act as replicators of the benefits of automation, so that the authorities promote the adoption of technology. This would require a legal reform enabling the use of voting machines, as well as the budget approval for the production of the equipment and the compliance with vital stages such as the information campaign, technician and voter training, and drills, among others.